GOVERNMENT: Independence from Britain, 1964. Multiparty democracy with president elected to five-year term. Governing bodies: National Assembly (legislative body) and cabinet appointed by president. Malawi, the former British colony of Nyasaland, is a small, landlocked nation in southeastern Africa. One of the most densely populated countries in Africa, many of its people live in desperate poverty. Since gaining independence in 1964, the nation has struggled to develop its economy and meet the needs of its people. About 500 miles from north to south and a little more than 100 miles across at its widest point, Malawi is a narrow, curving land on the western edge of Africa’s Great Rift Valley. It is bordered on the east by Lake Malawi (formerly Lake Nyasa), one of the largest lakes in Africa. The lake takes up more than one-fifth of the total area of the country. The people of Malawi have both historic and economic links to the lake. Malawi is a spectacular land of high mountains covered with lush forests, sparkling lakes, and rolling plateaus. The nation’s plateau regions enjoy some of the most fertile soils in east Africa, a feature that has attracted settlement throughout Malawi’s history. The nation’s climate is generally temperate, with a rainy season between November and April. Temperatures vary with the seasons, but because of the high altitude in much of the country they average between 55° and 85°F. The first Bantu-speaking inhabitants of Malawi arrived in the area nearly 2,000 years ago. Around the 1400s more Bantu peoples began migrating into the region from the north. 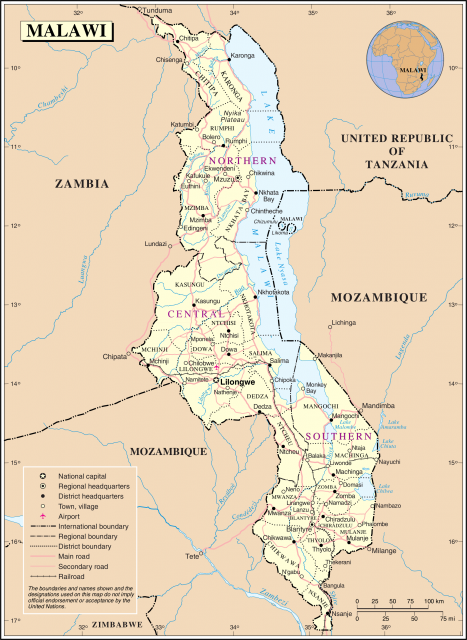 Some only passed through Malawi and continued moving into southern Africa, but many stayed and eventually established a number of chiefdoms and kingdoms. Among the most important of the kingdoms were Kalanga, Lundu, and Undi, which dominated different parts of the region from the 1500s to the 1700s. When Portuguese traders reached the region in the 1500s, they established commercial relations with various groups. Competition for trade became a key factor in political power, and some kingdoms declined in importance as trade went to other groups. During the 1800s other Bantu peoples invaded the region. These invasions were linked directly to the IVORY TRADE and the growing SLAVE TRADE. European missionaries became active in Malawi in the mid-1800s and established numerous missions and schools. British missionaries dominated and played a key role in the establishment of a colonial administration. One of the most famous missionaries in the region was David LIVINGSTONE. In 1889 the British South Africa Company received a royal charter to develop its economic interests in a large area of southern Africa, including the region near Lake Malawi. To ensure control, British officials made a series of treaties with chiefs in the region. As a result of these treaties, the region became a British protectorate in 1891. In 1907 the territory was renamed Nyasaland. As white settlers moved into Nyasaland they took much of the best agricultural land, leaving many Africans without land to farm. Unable to work and feed their families, many Africans migrated to Northern Rhodesia (present-day ZAMBIA), Southern Rhodesia (present-day ZIMBABWE), and SOUTH AFRICA to work as laborers in gold, diamond, and copper mines. Continued migration of laborers from Nyasaland in the early 1900s contributed to the growing poverty of many rural areas. The growth of the European-controlled PLANTATION SYSTEM contributed to the outbreak of rebellion in Nyasaland in 1915. Thousands of plantation workers rose up to protest the policies and brutality of their white employers. The rebellion, brief but intense, failed to win wide support before being crushed. Despite its failure, the revolt began a tradition of resistance to colonial rule. In 1953 Britain joined its Rhodesian colonies and Nyasaland into a federation. Colonial authorities believed that this would lead to more efficient administration and contribute to long-term economic and political development of the region. Africans, however, saw the federation as reinforcing white rule and opposed it bitterly. During the 1950s, protests against colonial rule in Nyasaland became increasingly forceful, leading to widespread arrests and a crackdown on opponents in 1959. In the face of growing unrest, Britain granted Nyasaland internal selfgovernment in 1963. The following year it gained full independence as Malawi. From independence until 1994, Malawi was ruled by Hastings Kamuzu BANDA. Prime minister from 1964 until he became president in 1966, Banda was named life-president of Malawi in 1971 under a oneparty political system. Under his autocratic rule, Banda extended his powers from governmental matters to such things as regulating hair styles and dress and censoring books, magazines, and films. Intolerant of any dissent, he dealt ruthlessly with opponents, who were either imprisoned, sent into exile, or killed. Attempts at revolt in 1965 and 1967 were crushed, and Banda faced no serious challenge to his rule until the 1990s. By that time he was coming under increasing criticism for HUMAN RIGHTS abuses. In 1992 Banda reluctantly agreed to hold multiparty democratic elections, and in 1994 he was voted out of office. The following year he was arrested and charged with killing political opponents. Banda was acquitted in 1995 and died two years later. Malawi president Bakili Muluzi, elected in 1994, worked to improve his nation’s economy, expand its infrastructure, and increase foreign investment. While his reforms led to modest improvements, they have had little effect on most rural areas of the country, which remain mired in poverty. Although more than half of Malawi’s land area is suitable for agriculture, much less than that is actually farmed. Nevertheless, agriculture is the nation’s primary economic activity, employing more than 80 percent of the people and generating nearly 90 percent of Malawi’s export income. Many of Malawi’s people engage in subsistence farming, and rural poverty is widespread. Cash crops, such as tobacco, tea, and sugar, also play a significant role in the nation’s economy. Malawi has very little industry and few mineral resources of any commercial value. The nation’s primary industries include cement factories, sawmills, shoe factories, tobacco processing, and the manufacture of textiles, chemicals, and fertilizers. Most industrial activity occurs in the southern part of Malawi, particularly around Lilongwe, the nation’s capital. Although Malawi’s most important mineral resource is bauxite, an ore that contains aluminum, little has been done to extract and use this resource. Malawi’s lakes and rivers provide a rich source of fish, but most of the catch reaches only local markets. The development of Malawi’s economy is hindered somewhat by the lack of an extensive infrastructure. The country’s rail network is confined to the southern part of the country, where railways link the nation with ports on the coast of neighboring MOZAMBIQUE. The country’s reliance on foreign investment and variations in foreign demand for Malawi’s agricultural exports have often created serious financial problems for the nation. Most of Malawi’s people are Africans of Bantu origin, although a few Europeans and Asians also live in the country, primarily in the cities. The major ethnic groups are the Chewa, Yao, Nyanja, Chipoka, Tonga, Tumbuka, and Ngonde. The Chewa, the largest single group, occupy the central region of Malawi and areas in the far south. Among the most distinctive aspects of Chewa culture are ritual masked dances and the SECRET SOCIETIES associated with them. Masked dances are a cultural feature shared by several of the other peoples of Malawi as well. In fact, Malawi is known throughout East Africa for its dance societies, which were used in the past as a tool in social and political control. The country’s ethnic groups share other cultural features. One of these is a matrilineal social system in which descent in traced through the female rather than the male line. Despite cultural similarities, the various groups in Malawi clearly regard themselves as different from one another. Yet the country has not faced the serious ethnic conflicts that plague other African nations.